The Internet is connecting enterprises into a global economy. Companies are exposing their directories, or a part of their directories, to customers, business partners, the Internet as a whole, and to potential "hackers." 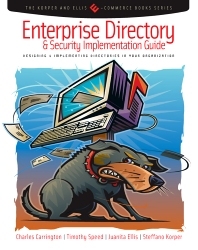 If the directory structure is compromised, then the whole enterprise can be at risk. Security of this information is of utmost importance. This book provides examples and implementation guidelines on building secure and structured enterprise directories. The authors have worked with corporations around the world to help them design and manage enterprise directories that operate efficiently and guard against outside intrusion. These experts provide the reader with "best practices" on directory architecture, implementation, and enterprise security strategies. IT managers, CIOs, and computer security professionals. @text:Steffano Korper and Juanita Ellis are experts in cutting edge technologies, both as university lecturers and industry leaders. Lectures and programs have been conducted at the University of Maryland, University of Texas, Southern Methodist University, and University of California, Los Angeles. Nationally recognized corporations and organizations have requested their expertise in developing and deploying e-commerce solutions in both business-to-business and business-to-consumer commerce. In 1998, they developed the E-Commerce Program. Program details may be found at http://www.going-beyond-et.com. They have been featured on local and national radio shows, including CNN, Daybreak USA, Computer Daze, and Business Day. They also have been interviewed by publications such as Entrepreneur Magazine.Steffano Korper holds a B.S. in Business and Management and an M.S. in Information Systems.Juanita Ellis holds a B.S. in Business and Management and an M.S. in Information Systems. Currently, she is working on a Doctorate in Electrical Engineering Communications at George Washington University.Korper and Ellis continue to rise in visibility in the world of E-Commerce. Their courses have expanded from Southern Methodist University and University of California, Los Angeles to dozens of short courses at major corporations, including Motorola and Sony. Going Beyond E-Commerce Technologies, Los Angeles, California, U.S.A.